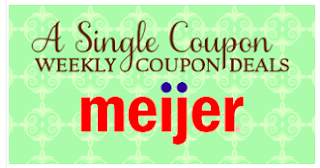 Buy $5 worth of Meijer brand water and receive $1 catalina or spend $10+ and receive $4 off your next order! I know many school's, work place's, churches, temples etc are having water drives for the residents of Flint, this would be a great way to donate some water and save some $$! Final Cost: $6.06, that's 8¢ a bottle! Final Cost: $7.16, that's 7¢ a bottle!